Installed at Nissan Motor Parts Center in Amsterdam, the solar roof produces enough renewable energy to power 900 homes and saves 1.17 million kilograms of CO2 per annum. Nissan today confirmed the switch-on of the largest collective solar roof in the Netherlands at its facility in Amsterdam. Installed on the roof of Nissan Motor Parts Center (NMPC) located in the country’s capital, the solar roof consist of almost 9,000 photo-voltaic panels and produce enough renewable electricity annually to power up to 900 households. It will also significantly reduce the facility’s CO2 output and, in total, it is estimated that the solar roof will save 1.17 million kilograms of CO2 per annum. 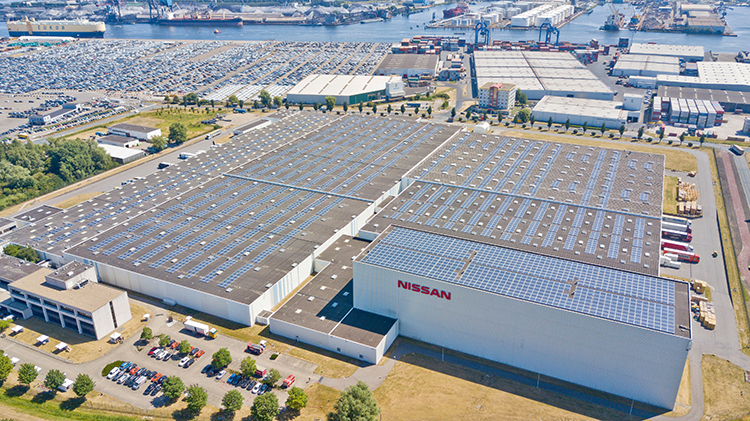 With the ability to produce almost 70% of NMPC’s annual energy, the installation of this immense solar roof represents a significant milestone as Nissan strives to make its operations more sustainable across Europe. Additionally, energy generated by some of the panels will be fed directly in to the country’s national grid.